Catherine the Great wanted her fifteen year old grandson Alexander to marry. On October 31st 1792 thirteen year old Princess Louise of Baden and her younger sister Frederika arrived in Saint Petersburg. Alexander chose Louise. She took the name Elizabeth Alexeyevna during her conversion to Orthodoxy on May 9th 1793. Their wedding was held on September 28th in the Cathedral of the Winter Palace. Within three years the empress was dead. Alexander inherited the throne after the death of his father Paul in 1801. Emperor Alexander I’s reign is well-known due to the Napoleonic Wars. Empress Elizabeth Alexeyevna is a stranger to many readers. 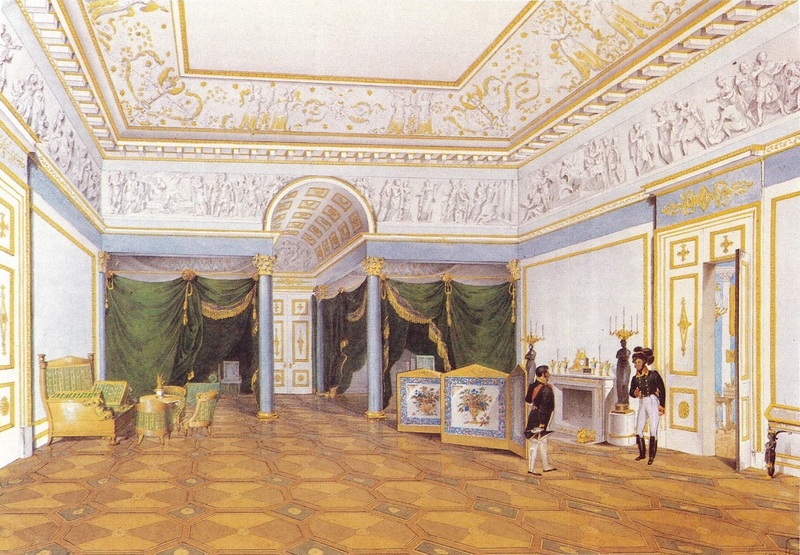 Her suite of rooms was on the 2nd floor in the northwest section of the Winter Palace. 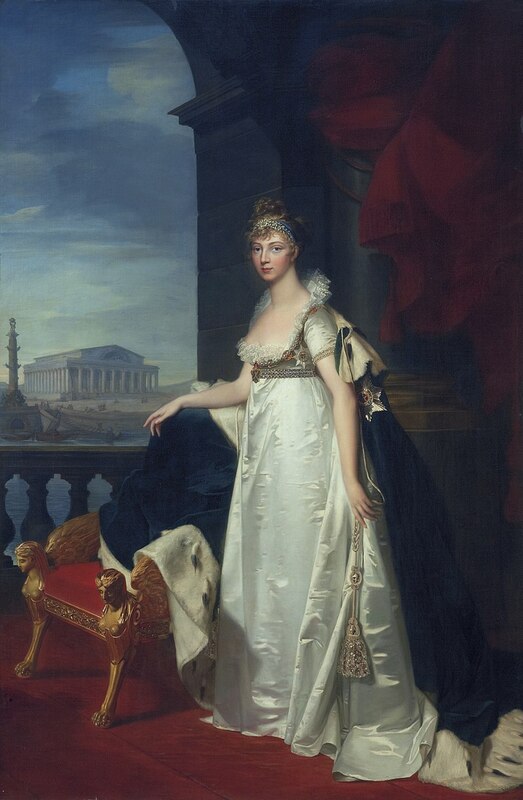 They were dismantled after her death in May 1826 for the new Empress Alexandra, the wife of Nicholas I.
Princess Varvara Golovina (1788-1819) wrote a memoir of her life as a lady-in-waiting to Elizabeth. She was also an artist, giving us a glimpse of Alexander I and Elizabeth’s rooms in the Winter Palace. The plan of the 2nd floor from 1801-1826 was reconstructed after the 1837. Visitors to the Hermitage today rarely recognize portraits of Empress Elizabeth, famous in her time, now hanging in the former Pompeian Gallery [#151-153] and other halls. Are you sure the bedroom isn't No. 184 on your floor plan? The rooms were used differently during the reign of Alexander I and Empress Elizabeth. Their bedroom was located in 186 facing the Neva River. 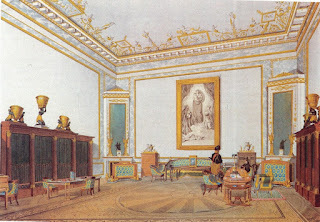 In 1826 and after the fire, Nicholas I and Empress Alexandra had their bedroom in 184 facing the Admiralty. And during the years of Nicholas II, they too had their bedroom in 184. I also noticed the frieze in Gau's painting of Nicholas I's bedroom and compared it to the frieze in the image you posted of Alexander I's bedroom. They are certainly similar. And it made me wonder if they could have been the same room. It's all very interesting and I appreciate your blog. The Getty plan is probably c1836 - there is no rotunda. I have Starov c1794, Ivanov plan c1809, Stasov's 1826. The room 184 was Empress Elizabeth's dressing room/lavatory and 183 boudoir. Hau's painting of the bedroom is after 1837. The friezes did not survive the fire. When Nicholas I had Elizabeth's rooms dismantled in 1826, friezes were probably moved to the bedroom 184 by Stasov. After the fire Nicholas wanted the rooms recreated as they were. The architects had artists' drawings of different decorative details and recreated them.